This entry was posted on Tuesday, December 20th, 2011 at 10:02 am and is filed under Tonight: 1984. You can follow any responses to this entry through the RSS 2.0 feed. Both comments and pings are currently closed. Yes, I fully agree that Bowie’s vocal is waaaaaaaaaayyy OTT – above and beyond the call of duty – and the instrumental arrangement is perhaps too far on the cheesy side. But the simple fact of the matter is that Brian Wilson and Tony Asher’s song – in addition to being just simply, exquisitely beautiful – is bulletproof. It doesn’t really matter what dodgy arrangement and performance choices are applied to it. God Only Knows is a song that I always find personally affecting, and I personally believe that it doesn’t really matter what dubious arrangement and/or performance choices are applied to it. It’s a teflon classic, and it can’t help but be genuinely moving. Not bulletproof to my ears. If I didn’t know the original version I’d just rush to change the station had it popped up, and wondered what the HECK that dreadful shite was. The terribleness of this rendition is undeniable – a friend of mine said that it sounds like they chose the worst take of every line. Definitely DB’s Across The Universe of the 80’s, only more so. The thing is, for me it’s the most perversely listenable thing on the record, in the way Lou Reed’s Sally Can’t Dance is – definitely so bad it’s good territory. The grotesque emoting at the end is just priceless. Ridiculous, but I got to confess that it is one of my guilty pleasures. The few times I listen to it, there is nobody home, crank up the volume and perform a dramatic playback, he he. By the way, I never got the grandeur of Pet Sounds. I try hard but I can’t get it. Bowie is almost exactly the same age as Carl Wilson, or would be if Carl was still with us. He wasn’t really too young for the sixties. Thanks for the great write-up. When I first heard his rendition I was 21 and his vocal delivery made me consider 3 possible meanings to the phrase “God only knows” that a teenager’s mind might think up. 1. God only knows: meaning only God knows. 2. God only knows: meaning that’s the only thing that God knows. 3. God only knows, meaning nobody knows, who knows? But like an aerosol can from an alien lab, Bowie manages to spray past all 3 possible meanings, and yet he belts it like its the most important part of the tune. I think Wilson was more subdued. If I were still a Mormon at the time I would’ve been impressed. Maybe he should have sung it as a secret love song to Mick Ronson instead! I would have loved to hear Bowie’s vocal on the Ava Cherry version, especially if they killed the mandolins. 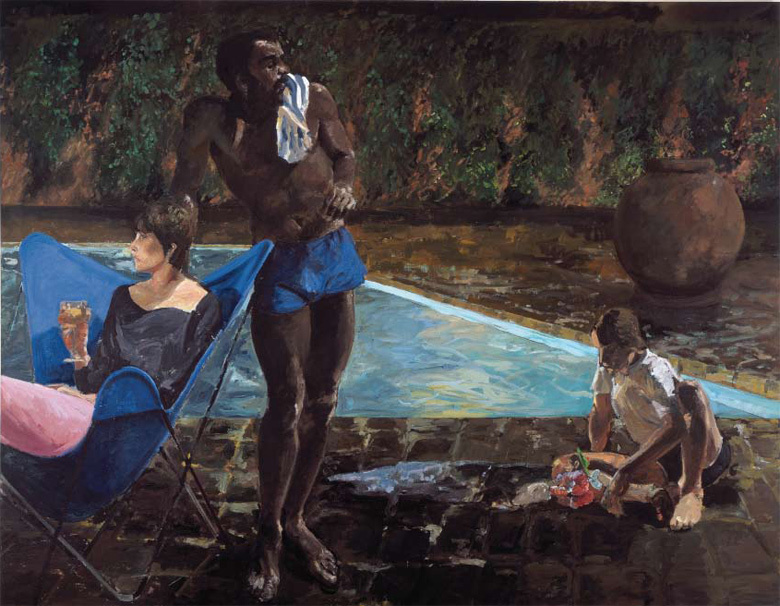 I couldn’t find a credit for the painting, My guess is that it’s by Eric Fischl. Somehow thinking of Fischel’s work made me think of how Bowie changed in the eighties. He became famous for the paintings of a sort of somewhat perverted or dark small town America narrative painting, they were really good. The two last shows I saw was one of portraits of his rich collectors and one of mostly unsexy naked people on the beach, those two shows I could not really relate to, even thou I could clearly see what he wanted to do, but they didn’t move me. Basically there was more production than content. Jasper–it is a Fischl–“Brat II.” Credits at the end of the post. I had really wanted to use a Jeff Koons, but ’84’s a bit too early. There is nothing I like about this. When I first heard it I actually couldn’t believe my ears. It’s just pure abomination. I usually love croonings baritones but even if Bowie sang this with just a paino I would still completely hate THE WAY he sings it. So for me the biggest fault of his cover is not even the production (though the production IS really bad), it’s his style of singing it. It just sounds so shallow, as if he recorded this for a TV ad. Blergh. For the record, I don’t listen to The Beach Boys at all. I love the Beatles though and I’m apparently the only person on the planet who likes Bowie’s Across the Universe. Strange. You should open your ears to the Beach Boys. I love the Beatles too and until a year or so ago had never bothered with the Beach Boys. Their surfer-boys reputation and treacly harmonies initially put me off but after making an effort, I now like them just as much as the Fab Four, even if their output is nowhere near as consistent as the Beatles’. So yeah, stick on Pet Sounds and give it a chance! For the record, I love Bowie’s Across the Universe too and don’t understand the hate for it. Glad someone else is out there…. Just when you think he’s hit rock bottom with ‘Neighborhood Threat’ he manages to create another layer of hell by brutally ravaging such a beautiful song. The way it just oozes with schmaltzy melodrama would make Celine Dion envious. If there were ever a collection entitled ‘The ‘Very Worst of David Bowie’ this would be its centerpiece. Wonderful write-up of the original, thank you for doing justice to it and proving why the Bowie version is so horribly, horribly bad. Well I was looking forward to hearing DB tackle one of Brian Wilson’s best but I should have known better. I do kind of like the Ava Cherry version though. Frankly, I can’t wait until we get to Never Let Me Down! 🙂 It is definitely my big guilty pleasure out of the entire David Bowie catalogue. In fact, I think I’ll go out on a limb here and say that the one Bowie disc released in the 15-year span between Scary Monsters (1980) and Outside (1995) that I’d put on just for the sheer pleasure of it would be Never Let Me Down. Haha, that’s a great idea. Hopefully we don’t have to deliver it to webcam while slaughtering anyone though. That might take the fun out of it. The way Bowie yelps “Gawwd only knoooows waht I’d beeeeee without you” towards the end sounds like a man in a spoof advert singing about his need for laxative…….. The Williams version in contrast is not bad at all – there is a strong MOR streak in Wilson’s work after all. Agreed – spot on Analysis. I heard the Bowie version of GOK before I heard the orginal (same with Let Spend The Night Together and the Stones). Although it is wildly over the top, bombastic, over produced and marred by association I much prefer it to the tepid original. That said I find much of the Beach Boys work headache inducing. Didn’t Angie Bowie refer to his cover of GOK as like ‘dudley moore taking the piss’ … not a bad summation. At least one can laugh at it … even if the jokes on Dave. Great comments from everyone and great analysis in the essay. I’m a major fan of the Beach Boys and really you can’t top their version. Even before I became a Beach Boys fan I didn’t like Bowie’s version. Even though I normally love melodramatic Bowie this version is just way too souless to have any impact. People are right, Bowie is a strange one when it comes to covers, he rarely gets it right. As to why there’s a whole essay just in that! So we’re all agreed, this is a great song! Anyway, I’d pretty much written off this whole album and hadn’t listened to it since 1984. But then, of course, Chris’ great writing makes me listen again and you know, if you cut out “Tonight,” “God Only Knows” and “I Keep Forgetting,” it’s not bad. Blue Jean, Dancing with the Big boys and Loving the Alien (the single version) are solid, enjoyable. Overall better than the next album, and probably better than Black Tie. Never liked the original ….sorry leaves me cold as does much of pet sounds. Cannot get into beach boys and could never get into any of the music , obviously some the singles are foot tappers but never touched me. This as with the many covers he has done is BADDDD and he simply hams it up like an xfactor finalist its awful. Funnily enough I like across the universe and much of pin ups but this misses the mark and I don,t like the orig I even would say its beneath being covered by Bowie . I don’t have time to write a full response right now but I think this piece is well off the mark (quite uncharacteristically for this blog). Here’s the basic problem: you don’t grapple *at all* with what Bowie actually does to the song: (i) he changes the order of Asher’s verses. (Numbering the verses in the obvious way, Asher’s 1,2,2 becomes Bowie’s 2,1,2; Williams preserves 1,2,2 as does Ava Cherry and Co.) (ii) He changes the second line of 2 to ‘My life…’ from ‘Well life…’ (Williams preserves ‘Well’, Ava Cherry confusingly modifies it to ‘Your’). No treatment that ignores these basic facts can be satisfactory. Asher’s 2 is the more coherent, but more desperate/self-involved verse (change (ii) further clarifies that/ratchets that up): ‘If you should ever leave me…’ I wouldn’t kill myself but I’d be dead inside so might as well have, and God Help me. Contrary to the write-up here, there is not a trace of a ‘pledge of love’ worked back to in that verse any more than there would be if a simpler, threatening (Reznor-ish!) ‘If you left me I’d kill myself’ idea had been used. 1 famously has a slightly eerie and incoherent thrust: ‘Yes, I might in principal leave you/stop loving you, but in fact I won’t and don’t you worry about a thing’. But running it *after* the completely self-absorbed 2 makes it’s own self-absorption clearer (the sort of certainty Bowie will give his lover is little more than a self-serving ruse, one that it’s a little self-defeating to talk about!) That’s the reason for all Bowie’s odd, pricklish emphases in 1 on ‘stars’, ‘need’, ‘sure’ etc.. And whereas when verse 2 is repeated in 1,2,2 it carries no additional meaning whereas in 2,1,2 it does: 1’s self-defeating ruse of concern and assurance for the supposed beloved has been exposed to the singer himself, hence he’s back to what’s really on his mind, that she might leave him and how that would make him feel if it came to pass. A slightly ragged/hysterical vocal, not a million miles removed from Heroes, is what we might predict at this point and to close, and that’s pretty much what we get. In sum, I don’t see anything ‘shockingly tasteless’ about what Bowie’s tried to pull off: pushing God Only Knows’s perspective into a study complete neediness (maybe he went a bit heavy on the Scott Walkerisms, but that’s hardly a hanging offense). I do, however, see lots of commentator blindness and insensitivity and rush to hyperbolic judgment. I love this blog, but this entry in my view needs a lot of work. Gotta say your points made are valid and must say I agree about the vocal its just as I said before I just don,t think much of the song in the first place. I don,t begrudge an artist fancying having a go at a song they love but let’s just say restructuring it and adding an embarrassing over the top vocal to it is a crime to my ears. Conceited of him to think his version was worth release it should have been left on the tape room floor. these are fine points, and this is an excellent rebuttal. The point about the switched verses is especially trenchant—that is something I frankly just overlooked, and you’re right, it does greatly change the context of the song, and makes DB’s cover a study in complete neediness and delusion. That said, I still think it is a terrible, tasteless recording, greatly oversung by DB—there’s a thin line between classic Bowie vocal grandiosity and sheer oversinging, and I think he sprints across it here— and, worse, given a garish, witless arrangement. But you’ve made a great case for it. I agree this isn’t one of the blog’s finer entries. Thanks for this – your points are all valid and a great addition to this entry. I have to admit as a child of about 12 this was the first version of the song I had heard, and for that reason when I sing it to myself it’s in Bowie’s order, which I just think works better. Perhaps it is because I grew up with a musical theater background (don’t judge), but I like it when Bowie goes over the top even though I don’t necessarily consider it artful. Subtlety has its place but it isn’t necessary for everything. This is pure heart on its sleeve melodrama, and you know what? Compared to the apathy on the rest of the album I can live with that. Yes, I think there is an element of Bowie desperately burlesquing himself or the self-he-was, via his influences, with this one. (Quite similarly to a lot of the Pinups excursions, come to think of it.) I accept that no one who’s an enthusiast of the Who’s “I Can’t Explain” could ever really countenance the Bowie Nineteen-Eighty-Floor-Show version in good faith. Coming around on them from a DB perspective, though, it’s not unexpected to see him skewing the originals, whether slightly or at an odd slant — as if to say, some aspect of this is me too, contorted in space and time, but at some level distinctly serious. I thikk the reference to the “soul” music quality of the original is worth seconding. Mr Wilson himself was an enormous fan of the girlgroup and soul movement earlier in the game…. Astronette’s version is the best in my opinion. I’m going to stick my neck out here. This is probably one of the best technical Bowie vocals on record. It’s not cool to like it, in fact it’s deemed shameful as you’ve all said…to this ears though, it’s a great performance and a solid cover. No wonder one of the writers cited it as the best cover of the song ever done. Cant remember which English music paper it was, but reviewing 1984 at the end of the year, Bowie got an “award” “for murdering God Only Knows by the Beach Boys”. Agreed at the time and still do!! Tonight is in my album Top 10. And I love the song! Shame on me! Time for my bad taste to be revealed- I actually think this cover starts well, but loses it by the end. If he had been reigned in, and everything but his vocal had been tossed out and replaced by something actually good, this would be remembered more fondly. As it stands now… “karaoke night” is too kind for it. Bowie’s version of this song was the first I’d heard in 1999, after finally relenting and buying “Tonight” after deciding that I needed to hear it all – even the EMI trilogy I’d avoided for years. I immediately hated this song; considered it right up there with “Across The Universe” and “If There Is Something” as Bowie’s worst covers ever. Then, in 2013 I bought the B.E.F. volume 3 album, “Dark.” I became quite taken by the version sung on that album by Shingai Shoniwa, whose performance was delightfully personable and ambiguous, as befits the rather exceptional lyric. I really began to like the song at that time. Mind you, I still had not heard the original yet. Then, last week, I finally bought a copy of “Pet Sounds” since I was seeing Brian Wilson in concert, performing it last night. I found the album underwhelming on first listen, but subsequent listenings are worming their way into my skull, though at this point I still find it overrated, albeit with moments of brilliance. After last night’s performance, the song has been embedded in my cranium this morning and I pulled “Tonight” to compare and contrast. I’ll just say that I consider hanging too good for him! I can imagine Bowie singing this, with his leg over the other, a cigar between his fingers and sporting a sunbath Roger Moore-face. It’s absolutely dreadful and at the same time hilarious. It’s impossible to listen to this and not start giggling. This is Bowie in his absolute Nadir, self-consciously parodying himself, belting out an absolute awful piece of schlock, almost proud in his cheesiness. Hard to imagine that one man sang Ashes to Ashes four years prior.